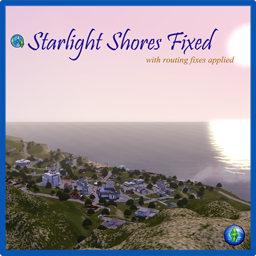 This is the Starlight Shores.world file with the FIXED Resources imported, for people who don't want to mess with their files in S3PE. Please read this download thread [In Testing]Resources for Starlight Shores.world's various Fixes for the stuff that has been done. Download all parts of the world, and rename them to get rid of the "MTS_ellacharm3d_<numbers>_" portion. See Game Help:DFDD4 Download the File#Content with Multi-part fileswiki with pretty pictures. Right-click on the file with "part1" in its name and "Extract here", or whatever command your program uses. See Game Help:DFDD5 Extract from Archive#Multi-part fileswiki with pretty pictures. How to remove or restore the file before updating? Delete the *.world file. Or if you want to reuse it after patching, rename it with a ".fixed" extension, so the filename becomes "Starlight Shores.world.fixed"
Rename the "*.orig" copy by removing the .orig extension (or from whatever you have renamed it to). As always, feedback is welcomed. Please report any other areas that you get stuck Sims at that I might have missed. If I may have been overzealous in the corrections or did some things wrongly. As and when I get reports of any issues, or new spots, or patch changes (if any). Made while on Patch 1.31-1.36. Would most likely be compatible with any patches in the future as well, as EA has never ever modified a .world file in the updates. The fixes contain 26 modified resources, imported from the other download thread. Would conflict with any other download that make changes to the .world file that changed the above named resources. The CAWers, and my CAW guru - simsample. Follow DFDD5 Extract from Archive#Multi-part files. 3. Place the extracted & joined .world file in this path and replace the default version (after making a backup).